Learning About Bees & Conquering Fear (Video) - JP loves LIFE! Lots of people are afraid of something and others just don’t get it. I have always been afraid, even terrified of bees. Growing up, I always heard that if dad got stung, we had to take him to the hospital, so when I got stung by honey bees and started swelling up like crazy, I was understandably scared. I let that fear impact all kinds of things which a lot of people never realized, because I run all the time. Well I bees make me jump and freeze, somehow I did both simultaneously. 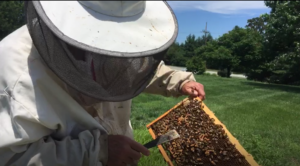 Ever since I met Jerry Hayes, the bee health lead at my office, I’ve been learning about bees… both actively and passively. Slowly I have learned my allergy to the stings doesn’t mean I can never be near a bee. And I don’t have to let them chase me in doors either. When I am going to be outside, I don’t wear fragrances. Bees are attracted to them, want to see what’s up, whether pollen & nectar are there and well, that freaks me out and I’m likely to swat at them. See point 1 for that complication. If bees seem to be buzzing around me, they are looking for nectar. They do that more in sunlight so if shade is nearby, I can wander over there and they usually leave me alone. Plant pollinator plants in areas of the yard where I don’t want to hang out, gives bees a place to go, so they are less likely to explore around me. Sunny corner of the yard works fine. Some folks would ask why I would bother challenging myself so hard. I’ve lived this long afraid of bees and I do have a health concern being stung by them. 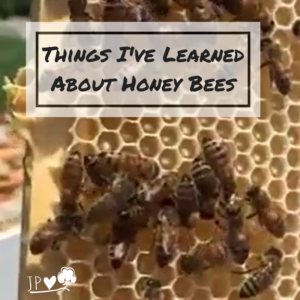 But understanding the environment is something I’ve always wanted to learn more about and these bees are so important to us…. I’d hate to do without blueberries, almonds, and a third of the other foods I eat that depend on pollination! There are 4,000 different kinds of bees in the US. – Honey bees are the only ones that are community builders. That makes them a great resource for pollinating lots of food crops. Without honey bees our dinner plates and grocery stores would look dramatically different. Honey bees travel up to two miles from their hive to find nectar so they can convert that into honey and pollen which provides food for the hive and sweeteners for us! The distance will really make you think…. to produce 150 pounds of honey, bees travel the distance that’s equivalent to 13 roundtrips to the moon. I’ve been working on this fear for a while and thought I was beginning to get it down. I even talked with friends when a bee came up while I was at their house eating dinner on the patio. 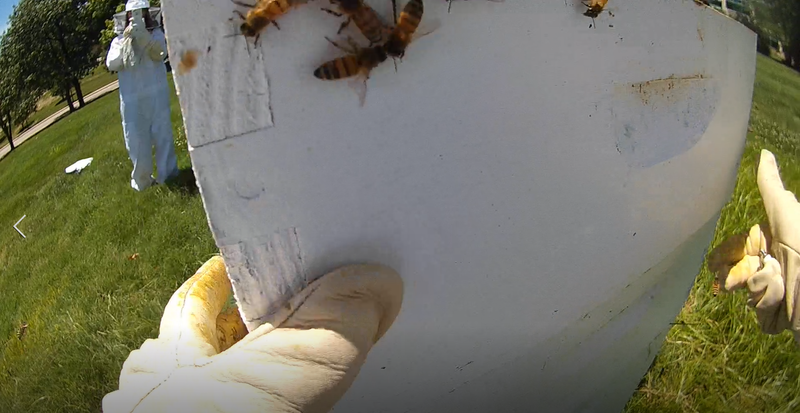 Going face-to-face with tens of thousands of bees…. seeing them bounce off my visor, hearing them buzzing at my ears, seeing them in my direct line of sight…. That is a step or two further. Jerry talked through lots of the stuff above, but seeing what he was talking about as we discussed it, seemed to solidify things for me. We saw two hives. One is a new one starting and the other is a full colony with different sections for different bee activities. Females are the workers who leave the hive for pollen, make the honey. As Jerry pointed out, it isn’t surprising that women do all the work. Male drones stay in the hive to mate. That’s it. They do nothing else. The bee larvae is sealed in a waxy area of the hive. It takes 21 days for a bee to come to life. The drones are bigger than females, they don’t have stingers, and look a bit different than we are used to. Afterall, we are used to seeing females only. 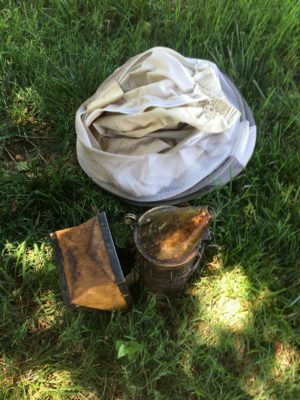 The gear for beekeeping is way heavier and less airy than it looks. That and Jerry’s comfort level have led him to pick and choose what gear he wears. But since it is highly effective in keeping me safe, I had all of it! The canvas coveralls are thick canvas since a bee could potentially sting it and the thicker fabric keeps the stinger from reaching my skin. That hat/hood/visor thing feels SO STRANGE. It zipped to the coveralls and then there were velcro covers for those zipper connections. I was sealed up! Thick leather gloves …. really thick and they went up to my elbow. Again…. very safe. Jerry had a small smoker — he let me use it for a bit… very cool! I wore my fauxpro to get some closeups. Know that I know the coveralls, etc I will position it differently next time. Zippers and elastic on the pants legs made sure I was covered down there too. Probably should have worn shorts under it with the heat, but I thought my bee leggings send a powerful signal! Another colleague recommended I wear my Chuck Taylor’s, I wanted to wear leather (thinking safety) so I did both! I was hosting a Facebook live session for a project with work, so I was doing video for that. Someday, we will get stable signals, a high performing phone, etc and that will go off without a hitch but for now, it’s bumpy. You’ll see a combination of video here — my mobile, my faux pro and a teammate’s camera all! I’ll try to do a short pithy video for Facebook this week, but friends and family have been really interested in the experience so this one is a bit longer and geared at people who would like to get more of the experience. Hope some of you take time to watch and I’d love to hear your thoughts! Wow, I loved seeing how the drones’ cells need to be bigger than the workers’! Thanks for sharing all this great information! I was blown away by it! Awesome experience! Thanks for sharing Janice! Always been fascinated with bees. Hope to go to my beekeeper’s home soon and watch her extract the honey from her beehives! So smart and organized.